A Reeds Spring man is charged with assault after allegedly punching someone and causing serious injuries. According to affidavits of probable cause, used in filing charges, Travis McMahan, 32, of Reeds Spring, went to a room at the Lakeview Inn in Branson West and punched a man after a verbal altercation, knocking him unconscious and breaking the victim’s jaw and teeth. The assault was reported the evening of Saturday, August 18. Officer Suzuki, of the Branson West Police Department responded to the call of someone being assaulted and knocked unconscious at the Inn. According to the victim and another reporting party, the victim went to a room in the Lakeview Inn and encountered McMahan knocking on a door. McMahan allegedly asked the victim if he knew a third party, and when the victim said yes, McMahan reportedly began verbally disparaging, getting in the victim’s face and asking if he wanted to fight. Soon afterward, McMahan is said to have acted like he calmed down and acted as if he was going to give the victim a hug. After the victim let his guard down, McMahan allegedly hit the victim in the side of the face, breaking his jaw. Another punch reportedly chipped and broke several teeth and the victim was knocked unconscious. 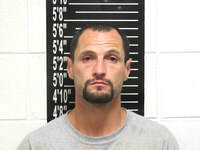 McMahan then allegedly fled from the scene. Officer Suzuki took the victim and witnesses statements when he arrived at the location. They reportedly told him that the assailant’s first name was Travis and gave a description of the assailant and the vehicle he fled in. Based on this information, the police were fairly certain that McMahan had was their suspect. The probable cause statement was filed with Stone County Circuit Court on August 22. A warrant for McMahan’s arrest was issued on Thursday, September 6. Travis M. McMahan was arrested and booked into the Stone County Jail in the early hours of Friday, September 7. He is being held without bond until he appears in court. He is charged with first degree assault with serious physical injury, a Class A felony.